Animal Farm Foundation’s Executive Director worked closely with Rhode Island the constituent who submitted the bill to his legislators, in order to help affect a positive outcome. She writes about her experience here. Afterward, there was a dangerous dog hearing regarding the incident. It became clear that the reckless dog owner didn’t care if his dog was destroyed. He’d simply get another dog if this one was gone. I think that the us vs. them syndrome is rooted in the chronic fringe that dances around those of us who are working hard to make a difference. 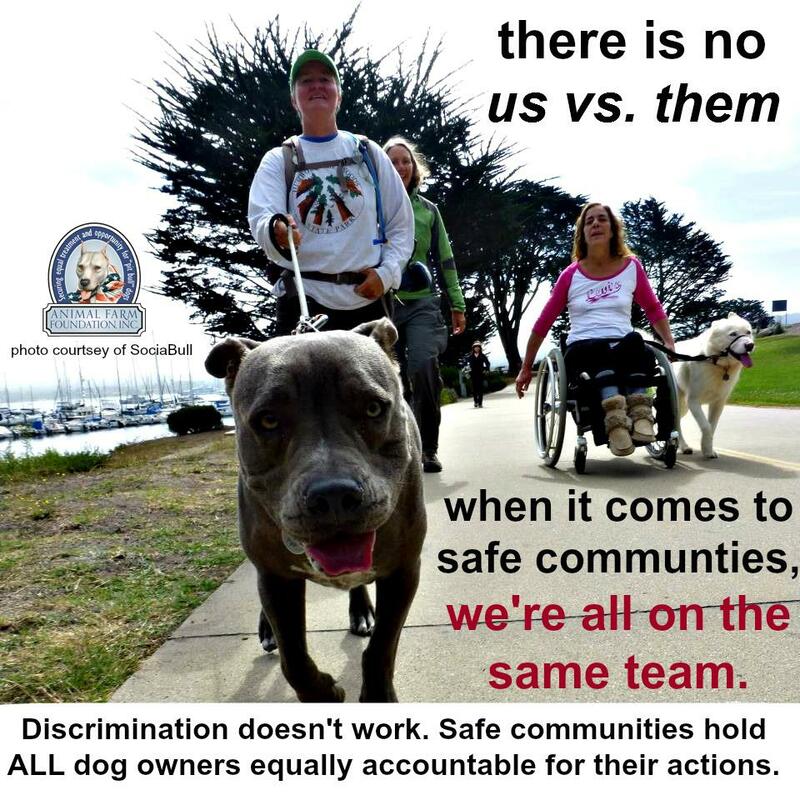 On one side, there’s the anti-“pit bull” dog, agenda-based hate groups that masquerade as champions of victims’ rights. On the other are the arrogant, reckless dog owners who disregard basic ownership laws allowing their dogs (“pit bull” dogs or any other dog) to become a nuisance or a threat to all of us. Both are the exception. They are on the far ends of the spectrum and have little in common with the majority of us who live together and are working towards fair, safe, effective solutions. These fringe groups do not get to define how the rest of us interact with one another. We’re all more alike than we think. The same goes for the dogs: “pit bull” dogs are not uniquely different than other dogs – for worse OR better. The way to move forward effectively isn’t to get stuck championing how different or special or unique our dogs are or by spewing anger at the other side. We can accomplish so much more if we focus our energies on what we have in common. We’re all on the same team. We all want safe communities. Previous “Pit Bull” Dog Advocates: Is the Info You Share Hurting or Helping?